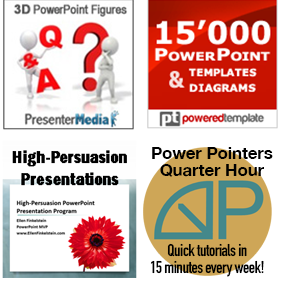 You are here: Home / Design / Animation & transitions / Create a slide show that really slides! Recently, it occurred to me that the words “slide show” came about because early presentations looked like they were sliding as the slides were moved on and off the screen. Here’s how to get this effect: Apply the Push Left slide transition to all the slides. Choose Slide Show> Slide Transition. From the list, choose Push Left. (In PowerPoint 2007, choose Animations tab> Transition to This Slide group, and click the More button to display the Transition Gallery. In the Push and Cover section, choose Push Left.) Make sure the speed is set to Slow; if not, the text will go by too fast for comfort during the transition. Then click the Apply to All (Slides) button. Apply a background with horizontal elements. I used a horizontal gradient. 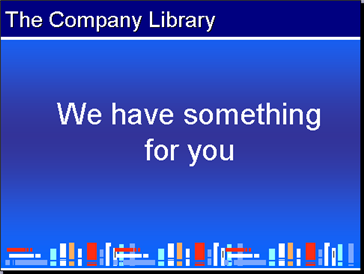 For the bottom, I found some clip art of books and copied it across the page, stretching as necessary to make it fit perfectly on the slide. Create a horizontal border on the top, bottom, or both. For the top, I used a simple rectangle, with no outline. I removed the outline to avoid having a vertical bar at the left and right side of the rectangle. Then I added a thin, white rectangle (also with no outline) below it. The borders can be on the master or each slide. I used both techniques. If you put the top border on the master, it could be your title placeholder. Otherwise, add an AutoShape to each slide. This presentation would work well with automatic timing, displayed on a screen in the company’s lobby. Thank you for this tutorial. I had not realised the possibilities of this transition before. In watching this presentation, however, I became aware of something else that I think needs thinking about. It has to do with the ruling off of the heading areas. I found that, because the area was ruled off, my eye dismissed that area, so that I was ignoring the headings on each page and reading only the body content. I think that this experience can be confirmed by cognitive science. Hmm, it’s always worth thinking about how design affects communication. I made that presentation a VERY long time ago! Now, I would probably use a white background both above and below the line and also use the title area to say something more substantive. But remember that it was meant to be a repeating presentation that would show on a monitor in a library–something like that. i have one website template it contains slideshow with jquerry. But i want in one div two slide show. how to create it? I don’t understand your question. Are you talking about PowerPoint? You appear to be talking about HTML.